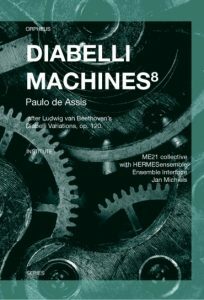 Imagining Beethoven’s Diabelli Variations as a musical time machine, the Diabelli Machines research project exposes productive tensions between Beethoven’s own time, its past, and its future. Diabelli Machines8 contains a CD, a DVD, and a written essay. The recordings, featuring Ensemble Interface, ME21 Collective, HERMESensemble, Paulo de Assis and Jan Michiels, present new pieces, composed in response to specific variations from Beethoven’s work, combined with the original variations, in their form for solo piano and in transcriptions for ensemble. The comprehensive new essay provides detailed insight into the ideas behind this project and its wider implications for future experimental performance practices of Western notated art music. New works by Juan Parra Cancino, Lucia D’Errico, Paolo Galli, David Gorton, Tiziano Manca and Bart Vanhecke.